When Brooklyn is selected as a default borough, all your searches will automatically be set in Brooklyn. You can still manually change this option while preforming the search or by changing the Default Borough Setting. Allows you to decide which installed application you wish to run the tasks with. 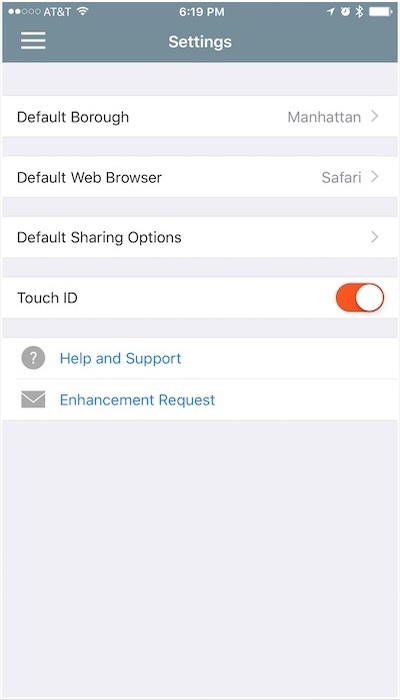 Gives you an option to disable Touch ID for OLR Mobile app. Check out our knowledge base directly from your mobile device, or submit a support request if you are stuck, or found an issue. We will be in touch with you shortly after. Clicking on this option will prompt you to choose e-mail client you wish to use. Upon your selection, a partially filled out e-mail will open up pre-addressed to our support team. Please enter the details of your request and send the e-mail.